The Felix PC was originally designed at the Polytechnical Institute of Bucharest, as a laboratory system, between 1983 and 1984. It was then taken by ICE Felix for mass production from 1985 to 1990. 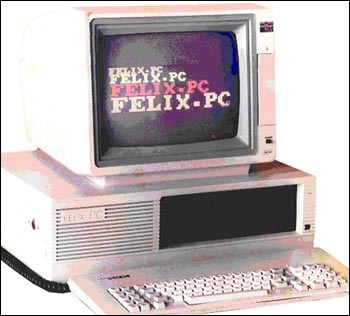 First Felix PC models had a modular structures, with a 8 or 16-bit bus, depending on the microprocessor used, 8088 or 8086. The 32K video card allowed a RGBI monitor or a PAL or NTSC TV set to be connected. Later, the card was updated for CGA and EGA monitors. Latest versions were close to the IBM PC features: 4.77 MHz 8088, 256 to 640 KB of RAM and an optional 20 MB hard disk. see more Ice-Felix Felix-PC Ebay auctions !